In 1993 Fidel Castro found himself on the ropes with the economic crisis and accepted the circulation of the dollar in Cuban territory. Until then, possessing foreign currency could cost you several years in prison. "The enemy's money" came to stay, although years later it would be replaced by substitute called the "convertible peso" or CUC. Among the most notable details of the decree that authorized the dual currency -- the CUC and the Cuban peso -- were the motives for doing so. The Official Gazette recognized that this measure "contributes positively to reducing the number of incidents characterized as punishable which will relieve and support the work of the police and the courts. That is, it would save work for prosecutors and judges if people were allowed to carry dollars. However, the key lay in the date chosen for the new law to take effect: August 13, the birthday of the Maximum Leader. Two decades have passed since that time and Cuban society is still gripped by monetary schizophrenia. Fidel Castro no longer holds the post of president but it seems that his brother is also given to mixing legal relaxations with the family calendar. On June 3 he commemorated not only the 82 years of his life, but he also put an end to a strategy of excessive control of Internet access. Just a few hours from the end of this day, the 118 cybercafés with public connections to the web opened. A somewhat bitter birthday gift for the General, who had been delaying however possible the conversion of Cubans into internauts. Most likely this small step toward information flexibility will also happen with the legalization of the dollar: it will not be reversed. Since this morning, Tuesday, the new public Internet sites began to operate with Internet and Intranet service. At a cost of 4.50 convertible pesos, a little more than $4.50 US, the user can access cyberspace for one hour. You can also choose to surf the national intranet for 0.60 CUC, or access ".cu" email only for 1.50 CUC an hour. In various tests performed -- undetected, so far -- none of the pages considered political were censored. With a minimum connection speed of 512 KBPS, the interface that welcomes the user as soon as the computer is turned on is called Nauta. Although all the workings and installed programs run on Microsoft Windows. 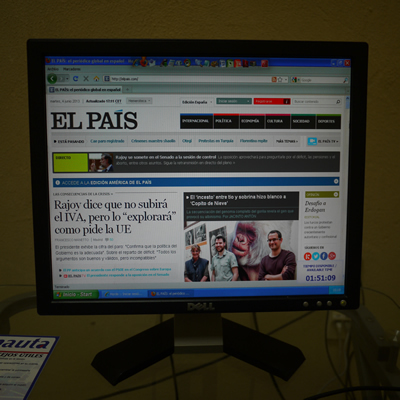 On opening day Internet portals accessible from the new locations included those such as El Nuevo Herald, news sites in the style of Diario de Cuba, and several blogs critical of the government written from the Island. The high cost of the service, in a country where the average monthly wage is around 17 dollars, seems to be the key constraint. This contradicts the deputy minister of communications who recently declared that "it will not be the market that regulates access to knowledge in our country." To date, those who have hard currency -- authorized to circulate by the former president -- will be able to afford entry to social networks, to classified ad sites, and the tempting employment or scholarship sites where you can register to try to emigrate. Curiously both measures -- the legalization of the dollar and this timid opening to the Internet -- have been the fruit more of pressure than the government's desire for openness. To allow Cubans to possess convertible currency was a decision taken in the face of evidence that in the informal market the so-called "greens" circulated every day more strongly at the end of the eighties and the beginning of the nineties. A similar situation happens now with the information that flows from the vast World Wide Web. Pirate connections to the web on one side and the advance of the clandestine webs of audiovisual distribution on the other, confirm the futility of stemming the tide of kilobytes. The first users who tried the cybercafés this morning were surprised at the speed of the connection, but lamented the excessive costs. Several official reporters hovered around the tables of a local center in the Vedado neighborhood trying to capture snapshots of Havanans throwing themselves en masse on the keyboards. Instead, they found a few cautious clients sizing up the limits of the new service. Each one had to show their ID card and sign a contract before seating themselves in front of a computer screen. A contract that clarified that the service should not be used for "actions that can be considered (...) harmful or detrimental to public security." A sword of Damocles that could be interpreted also from political and ideological considerations. From birthday to birthday, so go changes in Cuba. Twenty years ago it was the dollar... today the Internet.